The advantages are self-evident. The buoyancy of water makes us practically weightless when we move around in it. This enables us to protect our joints and bone structure while swimming in the water. At the same time, we need to employ a large amount of strength in order to move around in the water. For this reason, swim training is among the type of exercise which burns a great deal of calories, and help us achieve a more defined and slimmer figure. Tip 1 – Warm up before you go into the water: The basic rule is that the colder the water is, the longer you should do warm-up exercises on dry land. Tip 2 – Suitable temperature: Water temperatures between 21 and 23 degrees celsius are ideal for swimming. Tip 3 – Regular training is important: Swim training will achieve nothing when it is practiced for a short time intensively, but subsequently neglected. Tip 4 - Preferably shorter training sessions, but more frequent. This is more effective than doing less frequent but longer training blocks. Tip 5 – The right technique: the best approach is to get a professional to show you the various techniques, such as the crawl, or the backstroke. Tip 6 – Vary faster stretches with slower phases. It is especially important when starting training to swim the lap alternating between a moderate and a fast tempo. Tip 7 – Vary the type of swimming: In order to exercise all parts of the body, your training should include breaststroke, backstroke and crawl. Tip 8 – Practice breathing techniques: Just as in every other type of sport, it all depends on the correct breathing technique. For this reason, especially when beginning training, you should concentrate on inhaling and exhaling, in order to avoid stitches. Tip 9 – Set targets: Only those who set attainable targets will be motivated to do further and consistent training. Tip 10 – The right kit: A bathing cap and swimming goggles are indispensable for a successful swim training program. 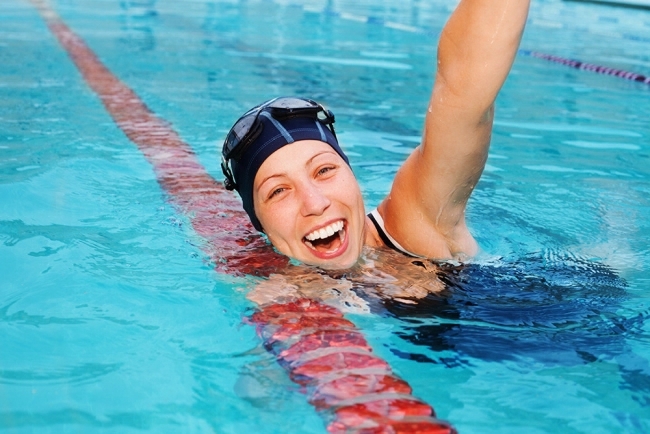 With these 10 tips you are set to start with your first swim training of the year. If you have any further questions or already have some experience and tips to share with us, please do so in the following comment section!